Knee exercise is vital if you are suffering from the painful condition of arthritis in the knee joints. The right kind of exercise can help to maintain or possibly even increase your range of motion, which helps to prevent the knee from causing sudden acute pain or giving way. Exercise helps to maintain healthy cartilage. It is also important to build strength in the muscles and tendons that support the knee, so that you avoid putting unnecessary stress on the joint itself when you walk, climb stairs etc. Choose a chair the right height so that you can sit on it with your feet flat on the floor and thighs horizontal. Consciously tighten the muscles in the right thigh (it can be helpful to put your hand on your thigh at first to feel the muscles tighten). You should see your kneecap move a little. Then push out with your heel, point your toes and move your toes around in a slow circle. Continue for up to 30 seconds, then repeat with the other leg. Do not let your knee fall away to either side. It must stay in a straight line with your leg. Still sitting, cross your legs at the ankles. Press your ankles together so that you are pushing down with the top leg and up with the bottom leg. The pressure should be equal so that the legs do not move at all. Hold for a count of 10 seconds and release. Change the legs around and repeat. You can have your knees bent or almost straight – experiment with this to find what works best for you. 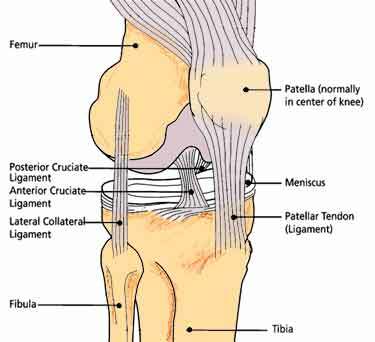 You should feel the muscles around your knee working, but it should not be painful. You should be breathing normally through both of these exercises. Be sure not to hold your breath. If you feel any unusual pain, stop exercising immediately and see your doctor. Remember too that it is always best to consult with your doctor or other health professional for advice applicable to your individual case before starting any exercise program. Some forms of exercise are bad for arthritic knees and should be avoided. This includes anything that involves jumping on a hard surface or moving in a way that risks twisting or over stretching the knee. Examples are volleyball, tennis, and running up and down stairs. You will probably naturally avoid these types of high impact exercise if you have arthritis pain but some people with mild arthritis might be tempted to continue with their favorite sport. Even ordinary running is not the best exercise for the joints. Choose cycling or swimming instead, which will avoid the damaging consequences of other forms of aerobic exercise while providing good knee exercise. My wife has bad knees. She’s been taking the Dr Powers Joint Support + Vitamin B12 for 45 days. She said that she could tell a difference after about three weeks, the pain seemed to be less. The tablets are easy for her to swallow and she has trouble swallowing a number of pills. for arthritis. i makes sure that i take food supplements that support joint health like glucosamine and niacinamide. exercise also helps a lot. for athritis, stretching and light exercise is recommended. lifting exercise can be too stressful on the joints. I was diagnosed with arthritis recently and what i do is take food supplements like glucosamine and chondroitin plus regular exercise. they really help a lot in managing arthritis. i have mild arthrtis ,i need to excercise to loose ,would using an eliptical machine harm my knees further. do you have any idea about cytotrome treatment for arthritis ..any info would be greatfull. Excellent advice, clearly written, with lots of common sense safety tips.